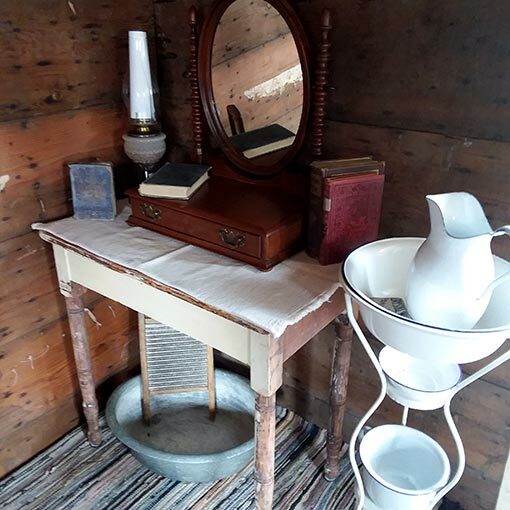 In the spring of 2017, behind an older two-story house on West Richmond Street in Dayton, a 119-year-old historical gem was “discovered.” It was the Dodge Quarantine Cabin. Eric and Cyndi Sams graciously donated the 13-foot-by-13-foot structure behind their house to the Blue Mountain Heritage Society (BMHS). By summer’s end, the cabin had a new home. This remnant of the 1898 Spanish-American War was disassembled, moved, reassembled, and restored. It now stands on the society’s Front Street lot next to the organization’s vintage Smith Hollow Country Schoolhouse. The house in front of the cabin was built in 1885 by John L. Dittemore and sold to the Dodge family in 1890. John and Mary Dodge had a son, Wesley, age 18. He was a Private in the U.S. Army 1st Regiment of Washington Infantry Volunteers, Company F.
In the spring of 1898, Wesley left home to fight in the Spanish-American War. 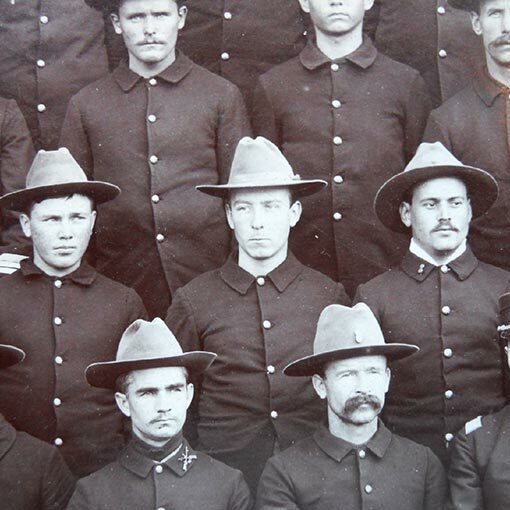 At that war’s end in August of 1898, common practice was to quarantine returning soldiers for 30 days as a precaution against diseases, especially yellow fever, that had plagued the war zones. The Dodge family had this cabin built in their backyard. It met basic recommended quarantine practices for returning soldiers and provided young Wesley with a place to convalesce. 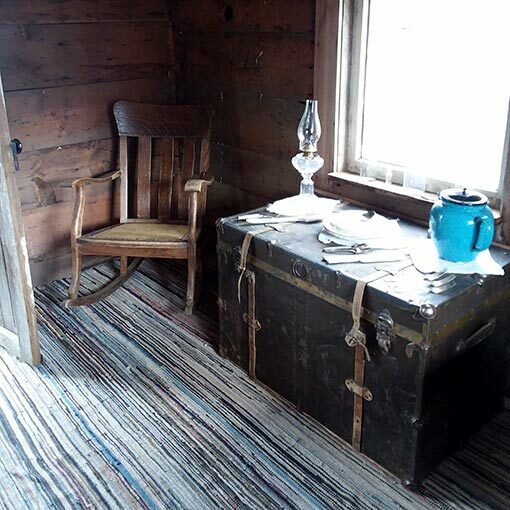 In the years that followed, the cabin was used as a guest cabin, a playhouse, and for storage. By 2017, although showing signs of age and in need of a few repairs, the log structure was deemed sound enough to be ripe for restoration. 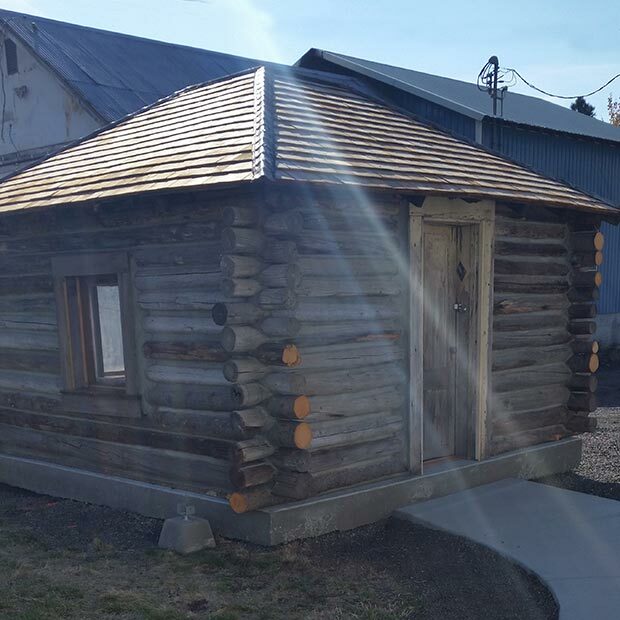 To do the cabin historical justice and insure its structural integrity, BMHS hired a state-licensed construction contractor out of Richland, Washington. Pillars of Society Woodworking, LLC, is a two-man company, specializing in restoration of old buildings. 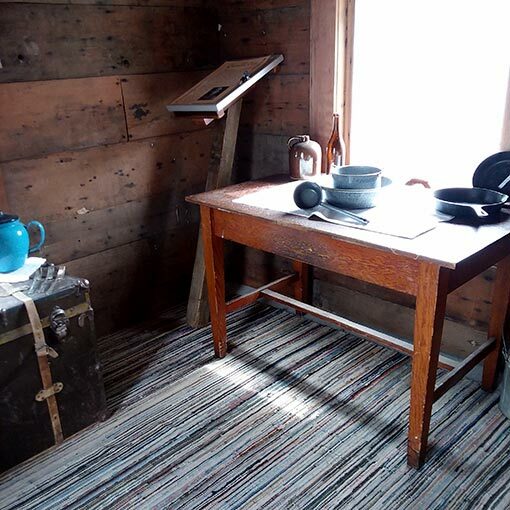 Rick Nicely and Beau Sabin undertook the dismantling, moving, and rebuilding of the cabin with a tremendous amount of enthusiasm and reverence for preserving its historical importance. The process was painstakingly detailed: Before taking the structure apart one nail at a time, Rick and Beau carefully labeled each individual component. The pieces were then put on a trailer and moved to the Front Street location. Salvaging as much as possible of the original structure was the primary mission. And historical integrity was maintained by replacing non-restorable parts with similar materials. For example, by working with local forestry officials, small logs were resourced from the nearby forest. Since it was fire season and a ban on chainsaw use in the woods was in effect, the team had to chop down the needed standing-dead trees with an ax—just like the area’s original pioneers. Reclaimed wood from a recently completed barn restoration project was used to replace any interior boards that could not be salvaged. All in all, the end result is a sound historical structure to be appreciated by many generations to come. It’s a structure that links Dayton to the far away locations where the late nineteenth-century Spanish-American War was fought—Cuba, Puerto Rico, the Philippines, and Guam. Prior to the cabin being relocated, a careful hand excavation around the cabin’s foundation was done. The process revealed several items, including a horseshoe, a long wooden spoon/stick, an unbroken early-day light bulb and even small lumps of coal. These unearthed treasures are on display.